I can’t believe it is November let alone Thanksgiving is this week!! The year is almost over. I like to dress up on Thanksgiving and hubby and I make the feast together. We are traditional when it comes to making this special meal but hubby is a master when it comes to cooking the turkey. Make sure you are following my Instagram stories, as I will post pics and videos of our day. 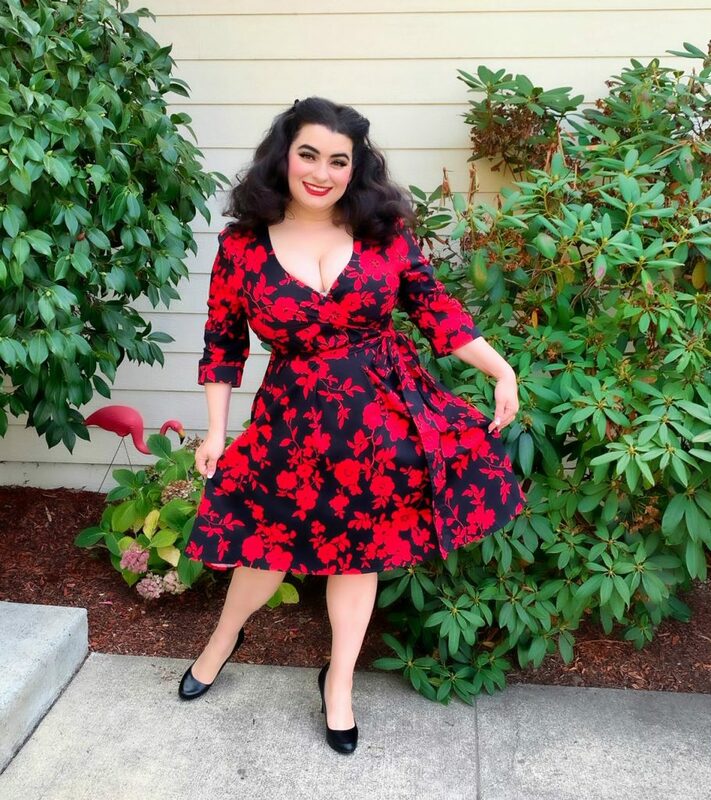 When I first saw the Katherine Long Sleeve 50s Style Swing Dress in Black/Red Floral from the UK brand Dolly and Dotty I loved the style (a faux wrap top) and the print was bold and beautiful. It was going to be my Thanksgiving dress this year. 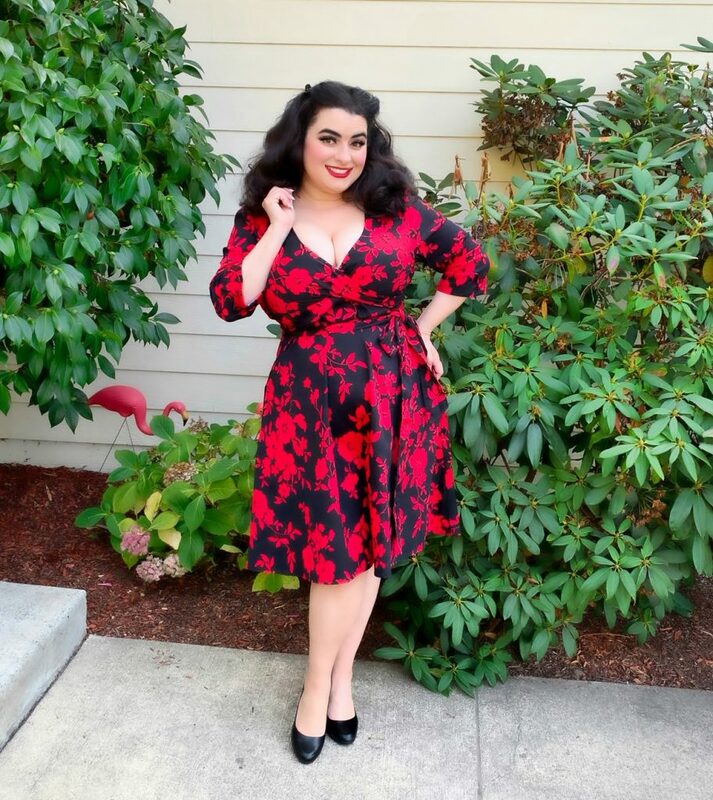 If you have been following my blog for a while then you know that wrap style dresses are my go-to because they always fit my large bust. 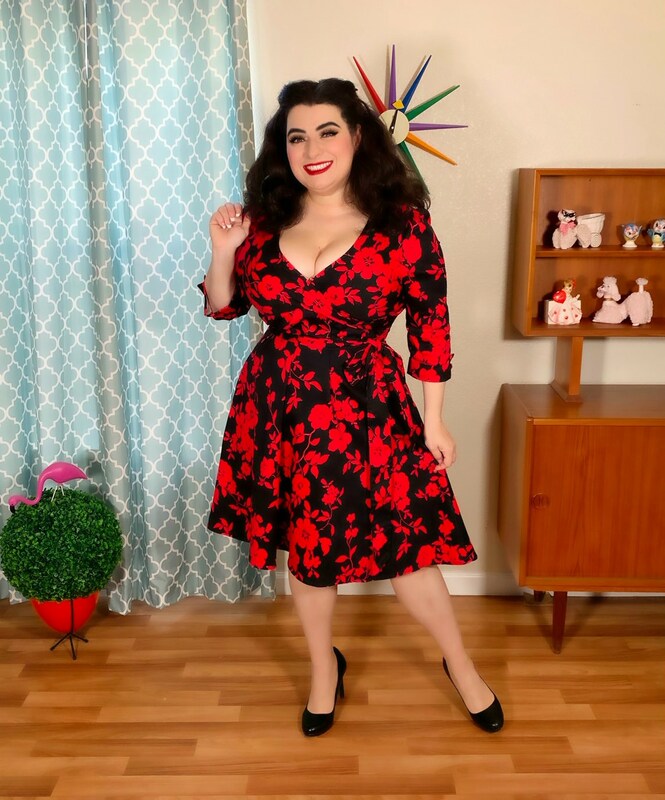 The Katherine Long Sleeve 50s Style Swing Dress has three quarter length sleeves with retro turned up cuffs and a flared 50’s style skirt. The faux wrap top fit me perfectly and I decided to tie the fitted belt in the front and wear it on the side as that nipped my waist right in. There are also pockets!! This dress is so comfortable and very figure flattering. The skirt has a nice fullness and can easily accommodate a petticoat although in these pictures I am not wearing a petticoat. The fabric is very nice weight cotton and hold its shape beautifully. The bright pop of red flowers is very dramatic and accessories can be kept to a minimum. I feel so beautiful and glamorous in this dress. Dress is selling out quickly and available in sizes 6 – 26 so hurry on over to Dolly Dotty and snap up this gorgeous holiday dress!! A big thank you to my sweet hubby Gary.